Not just because its Ryan Choi, The Atom. But because he's got a weapon that hits people with PROTONS. I like my Atom with more science than whatever the last run was (or most runs, meaning I kind of like The Atom as utility science guy). Science-ish fiction. Nice to have a toy based maybe something on the LHC. His little widget/rod thing is kind of a mace. Maybe a mini-LHC. And, of course, the LHC "is intended to play exceptionally violent and scientific games of sub-atomic curveball billiards, in which protons will barrel round corners and smack into one another at close to light speed. This will cause them to explode, hurling various kinds of mysterious sub-subatomic gubbins in all directions." 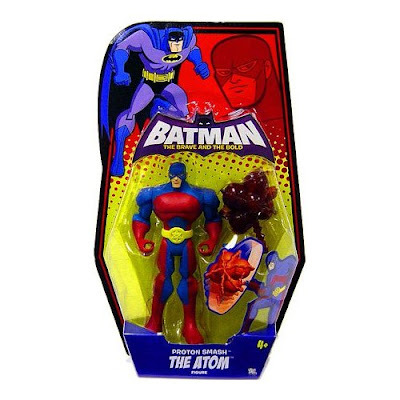 Just about what you'd expect The Atom to be doing in the comics, really. So, basically, he's smacking people with protons, as if their face were yet another proton. And that is awesome. Really, I quite liked the last Atom run by Gail Simone. The Mike Norton art helped as well. I enjoy science fiction laced superheros. And smacking people around with quarks. I liked Simone's Atom at first... and then I felt like she had no idea where she wanted to go with the idea. The mix of magic and science could have worked, but it just never really gelled for me as a long-running series. I also didn't really understand why they went through so many hoops explaining how Choi was so westernized when it would have made more sense to just say "He's from Chicago."